This paper presents a new predictive capability for simulating massive MIMO antennas and beamforming in dense urban propagation environments. Wireless InSite's MIMO capability is used to show predictions for SINR at specific device locations and the actual physical beams, including unintentional distortions caused by pilot contamination. Remcom announced a partnership with Moasoft Corp., a provider of software and consulting services in South Korea. The partnership will expand Remcom’s presence in the Korean market and enable customers there to more easily access its electromagnetic simulation software, services and support. Remcom announces a new circuit element optimizer for XFdtd® electromagnetic simulations software that optimizes matching circuits for several antennas serving multiple bands simultaneously. XFdtd’s Circuit Element Optimizer determines lumped element values based on the following goals: radiation efficiency, system efficiency, and S-parameters. This simplifies the antenna matching workflow because the circuit elements remain in the electromagnetic layout structure during optimization. Remcom will soon be releasing a new version of XFdtd, with two new add-on modules: an Electrostatic Solver and an RF Circuit Optimizer. 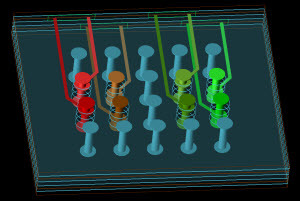 Remcom announces PinBuilder™ electromagnetic model automation for XFdtd® EM Simulation Software. PinBuilder, which automates the creation of pin-field breakout models for XFdtd simulations, will be available in the software later this year.